Hi friends, happy New Year! I hope you all celebrated your pants off! I could practically see the re-commitment to health in the aisles of Whole Foods this past weekend, so in that spirit I’m sharing my not-so-secret secret for staying on track. I don’t think I’m alone in the boat that sinks when it hits evening and I have a meal to cook ahead. That’s when takeout starts sounds mighty fine and batting her eyelashes at me!!! NO WAY THAI FOOD. So here’s what I do as a preemptive strike to VERY EASILY SEDUCED BY THAI TAKEOUT SARAH. I prep on the weekend. 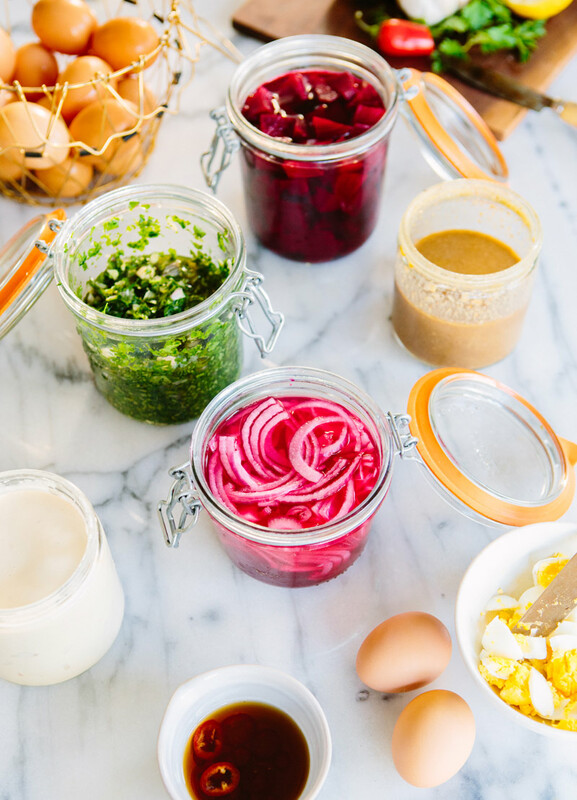 Sauces, dressings, pickled yummy things, hard boiled eggies, roasted garlic, etc. Sometimes I even chop veggies if I know I’ve got long days ahead. That way, when the clock strikes dinner and I’ve got nothing in the line up I can throw something delicious together. Because somehow as lazy as I get if I know that all I have to do is roast some veggies, cook a grain, or throw together a salad I become a superhero. A clean eating superhero. 1. Hard boiled eggs- I love to have a handful of eggies pre-cooked and ready to eat in our refrigerator. They make great snacks (with hot sauce!! ), but I also love them crumbled onto salads, roasted veggie bowls, topping avocado toast, and occasionally whipped up into a quick egg salad with finely chopped onion, celery, and whole grain mustard. Eggs. Eggs are the answer! 2. Chimichurri (recipe here)- I’ve professed my love of this herbaceous sauce more times than I care to remember. But for good reason. It’s basically instant yum in a bowl. We top our eggs with it in the mornings (scrambled with heaps of veggies or fried in ghee with crispy edges), pile it onto our salads at lunch, toss our veggies in it for dinner (mmm, like this!). We’ve eaten it on tacos, topped breakfast hash with it , I developed this recipe exclusively as an excuse to eat it with cauliflower and quinoa, many a bean has been tossed in it for an impromptu salad, aside a perfectly poached egg with sauteéd greens. It’s my favorite so we always have a giant jar of chimichurri in the fridge. When all else fails…. chimichurri. 3. Pickled beets- A meal isn’t a meal without some tang. Right? Cue pickled beets. I make mine by roasting whole beets until easily pierced with a knife, peeling off skin with my hands under cold water, cutting into 1″ cubes, and finally placing them cooled in a jar with 1/2 part apple cider vinegar 1/2 part water (I forgo the sugar but if you prefer a tablespoon of the sweet stuff heated up with the vinegar beforehand will do the trick, or of course more to taste.) We use these primarily for salads. Or to eat while I stare into the fridge and debating whether or not I’m truly hungry. Life saving to have these on hand while I ponder such important questions!!! 4. Whole grain mustard and balsamic dressing- This is my go-to salad dressing, and I alternate between balsamic and apple cider vinegar, whole grain and dijon depending on my mood. Either way, I mix Extra Virgin olive oil, salt, crushed garlic, mustard and whichever vinegar I choose until it tastes good. I add honey for sweetness when making it with apple cider vinegar, and throw minced shallots in if I have them on hand. I top salads with this, but I’ve also been known to drizzle it onto a baked sweet potato here and there. 5. Garlic and Lemon tahini dressing- This is another dressing I love to have on hand. This usually accompanies any grain/veggie bowls I throw together (any variations on this one). It also makes it’s way into veggie wraps, greek salads, regular salads, roasted veggies, falafel, and my favorite way to enjoy it lately: poured over steamed veggies with garlic gomashio and pumpkin seeds. 7. Hot red chili sesame oil- This is so simple to make that there’s really no reason to NOT make it. In this case I’ve thinly sliced a red chili pepper and added it to 1/3 cup of oil. I had a conversation in the grocery store with a woman who was asking a Whole Foods employee about them- and the employee was advising her that they’re extremely hot. It’s really the seeds that I find feisty, so I usually slice up the entire pepper, add a couple of seeds and let it sit for a bit. I add seeds and taste test until it’s at a level I enjoy. I sometimes make it with a lighter avocado oil, but lately I’ve been using toasted sesame oil. And then I use it in stir fries, fried rice, cooking shishito peppers, noodle bowls, in any of my Asian inspired cooking that it’s appropriate where I’d like to add a little heat! 8. Pickled red onion- (recipe here) I like to have a jar of these in the fridge at all times, but they last awhile so it’s only the occasional sunday that I have to re-make. They’re perfect toppings to tacos, veggie or regular burgers, hummus. And chopped up they bring flavor and to salads, bean salads, and egg salad. I also love them in quick and easy to throw together wraps like this one. 9. Roasted garlic (not pictured) I sometimes forgo making roasted garlic on my Sunday prep IF I have plans to be roasting veggies within a day or two, as I did this weekend. But here’s a great how-to! I eat these like candy when they’re warm. Mmmmmm. I also add them to my favorite hummus, add them well mashed to mayo to create a garlic aioli, smash them into my potatoes or sweet potato mashes, infuse olive oil with it for dipping crusty bread into, spread it straight onto crostini and drizzle generously with olive oil, add it to my soups and stocks, and finally- I throw it into piles of roasted veggies or stir fries. Going to be referencing this post again and again. Thanks so much, Sarah. I love when you share food posts! Belting out HELLO FROM THE OTHER SIDE while sipping rose and chopping cilantro. My heart is so warmed that I am not fighting the good fight alone. You are the coolest, Sarah. So many great ideas – particularly excited to try out the red hot chilli sesame oil! 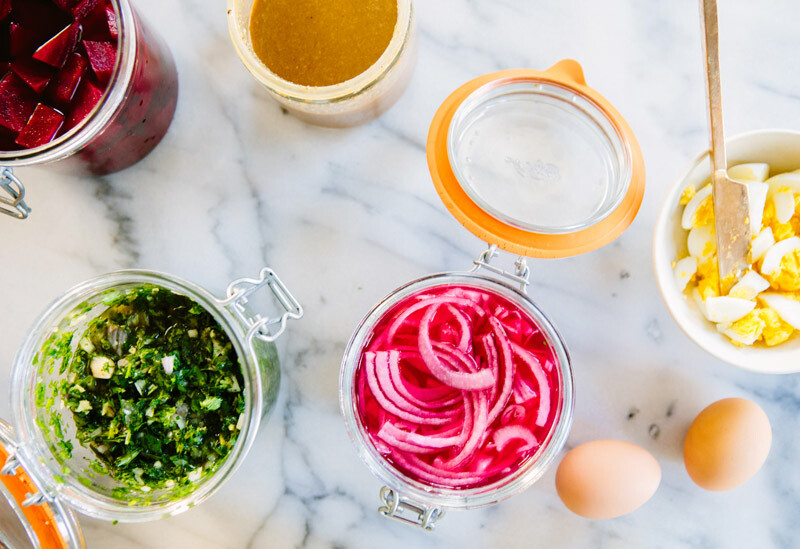 Some of my prep tips – I always have a jar of pickled ginger (I use the recipe from My New Roots) on hand, as well as preserved lemons as they both make any simple grain/vege dish taste amazing. I’ll also often whip up a batch of hummus or labneh on Sunday for snacks and lunches during the week. And I like to cook enough for dinner on Sunday evening that I can reheat for Monday night too. Happy New Year to you 🙂 Such a great ideas! OMG I love strong vinegary flavors too – never made chimichurri! gonna follow your recipe! you are my spirit animal I think! After reading this list, I know for a fact you’d like Candied Jalapeños. AKA- jalapeño slices pickled in vinegar with sugar. Put on everything. Eat. Repeat. Chimichurri saves me time and time again! I make a batch of quinoa, chop and stir fry whatever vegs I bought that week and during winter/fall normally throw something in the crockpot- usually a whole chicken with a jar of trader joes salsa verde. Love to make soups on Sundays too! Great to have on hand for the week. I too am easily seduced by Thai, I think I could eat it every day. 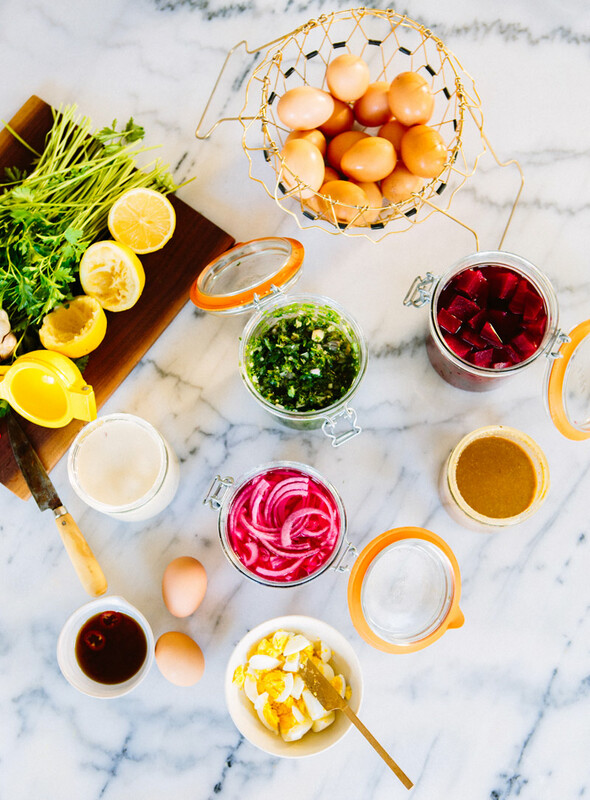 These ingredient preps sound delicious & easy, thanks for sharing. These are such great “get ahead” tips Sarah! I need to be better about cooking on the weekends, but I spend so many of my weekends away from home that I always feel like I am behind. During the week I am lucky if I have two out of five nights where I cook something more involved than pasta. It is a constant struggle between wanting to eat right and simply not having the time and/or creativity to know how to cook healthy food quickly. What is your go-to bread? After years of not eating any breads, I’m starting to add them back to my diet. First time commenting, long time reader. Just wanted to say I made your chimichurri sauce and potato hash tonight and it was awesome. Actually, every recipe I have made of yours has been amazing and not just for me but my husband too (which is hard to do). I am a 70% raw vegan and he is a total carnivore. Finding recipes we both like is a big deal. I have made your sweet potato corn chowder, peanut carrot salad, mashed celery root and many others. Every one has been a big hit. Thanks so much for posting and good luck on your travels this year.